Bus from KL to Kota Bahru is the most convenient and most economical mode of transport. Train is used to have the advantage in offering more comfortable journey over the bus. However, modern bus has improved the condition with reclining seat and big leg room to offer equally comfortable bus journey. Besides that, bus from KL to Kota Bahru is faster than taking train. This is because train has to go south for a transit in Gemas for East Coast line train service bound for Kota Bahru. Taking flight is much faster option to go from KL to Kota Bahru. With just 1 hour flight duration, you are in Kota Bahru Airport (Sultan Ismail Petra Airport), as compared to about 7 hour bus duration. However, flight fare is usually much higher than bus fare especially when you do not book your flight ticket in advance and when you travel over the weekend. Transnasional and Perdana Express are the two famous brands serving bus from KL to Kota Bahru. Locals favour the brands because of the comfort, punctuality and having more schedules to choose from. Another bus operator with quality bus service is Mahligai Express who provides daily trip from KL to Kota Bahru. The bus fare for bus from KL to Kota Bahru is at about RM 44.00. Duration required for bus from KL to Kota Bahru takes about 7 hours depending on traffic condition. 1 Washroom break will be provided during the journey. The departure point for coaches going to Kota Bahru in Kuala Lumpur is at TBS (Terminal Bersepadu Selatan). TBS is located just south of the city centre. The closest LRT station is “Bandar Tasik Selatan” on the Ampang Line. 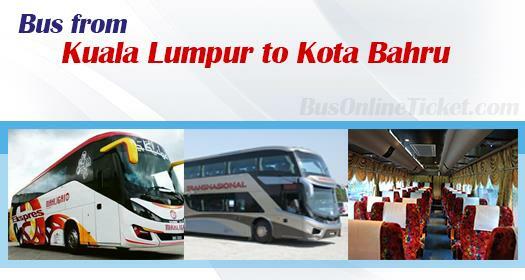 Online booking for bus from KL to Kota Bahru in BusOnlineTicket.com is reliable and convenient. By booking ticket in the BusOnlineTicket.com, it saves you from the hassle to buy ticket at bus terminal, especially in Kuala Lumpur where traffics are heavy and car park is expensive. For those who do not possess credit card, BusOnlineTicket.com provides the internet banking option.